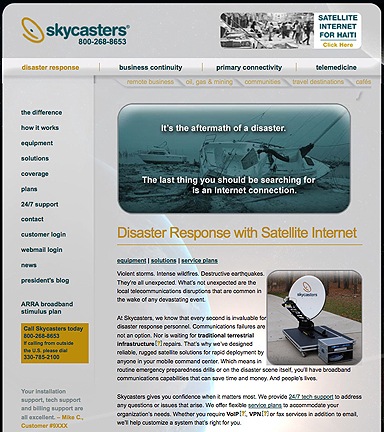 [SatNews] On Tuesday, June 8, 2010, Skycasters made history when the Company placed two copies of a 218-page proposal into the hands of the United States Postal Service, destination: the USDA RUS Broadband Initiatives Program in Washington, DC. Entitled “Project SafetyNet: A Satellite Broadband Proposal for Improving Rural Public Safety and Prompting Economic Recovery,” the proposal will have greater impact on more Americans for less investment than any other proposals. “Our proposal will bring lifesaving and economy-stimulating satellite broadband Internet to public safety organizations in unserved portions of rural America,” states the opening lines of the proposal’s executive summary. “We are seeking a $5.1 million grant to improve public safety and prompt economic recovery for 37 million Americans.” The math? That’s thirteen and a half cents for each person served. The equation: give rural public safety organizations, such as police, fire, search and rescue and EMS, the power of the Internet at their fingertips, and you not only save lives through faster, more coordinated response — you create jobs, and help prompt economic recovery. Unlike other proposals, Skycasters has taken the next step already: we contacted hundreds of rural safety organizations to identify those that need our technology to save lives and stimulate the economy in their areas. These beneficiaries, should the proposal be funded, will receive equipment including either the Skycasters Mobile Satellite Trailer or the SkyPortable flyaway antenna. Each safety organization will receive Skycasters service that provides a committed information rate of 2.04 Mbps down and 768 kbps up, with a maximum information rate of 6.09 Mbps down and 1.5 Mbps up. 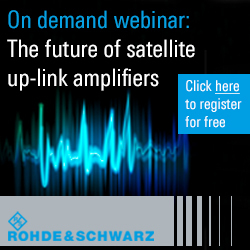 Skycasters has requested funding for a total of 80 sites in 17 states, including equipment and two years of service.